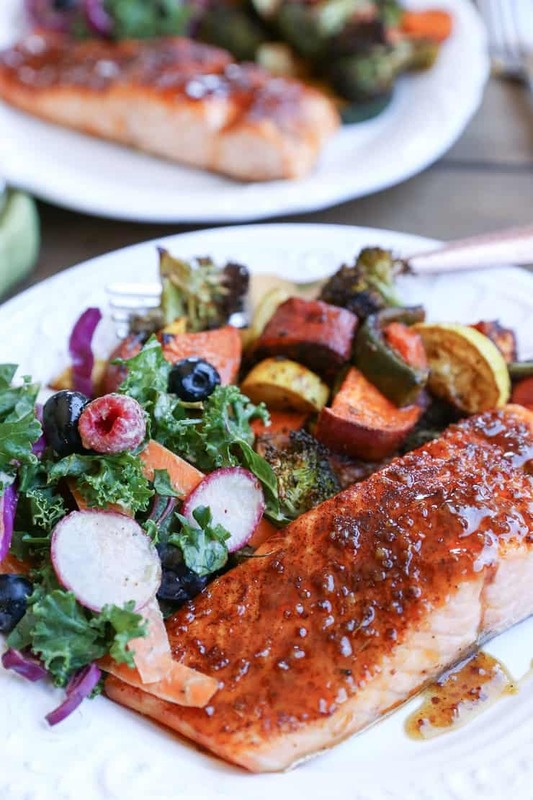 Crispy honey-glazed salmon with roasted vegetables and kale salad makes for a clean and satisfying meal perfect for any night of the week! After I went to Cordova, Alaska last year to visit Copper River Salmon, I think of Alaska every time I make salmon. I think about the beautiful landscape, the people I met on the trip, and I recall the big picture: to know your fisherman, and to source wisely. In case you’re new to The Roasted Root, or you missed the trip recap, feel free to read Part One and Part Two to learn more about my trip, Copper River Salmon and the fishing industry, then circle right on back to this post. My experience in Cordova, Alaska was incredibly valuable for me. When salmon season started back up again in May, all I could think about was getting back to Alaska. Alas, life (and work) has a tendency to put a hold on things, so I won’t be able to return this year. So in the meantime? : I dream, I reminisce, I source salmon wisely, and consume gratefully. Crispy salmon is like crack for me. There’s just something about a fatty cut of King salmon, broiled to perfection that sends the ultimate pleasure signals to my brain. I can’t think of any other animal protein more satisfying! If you follow my Instagram stories (or are a seasoned reader of this blog) you know I love broiling salmon with just a few simple spices on top to achieve that optimal crisp. Although I normally just broil salmon with some olive oil and spices on top for a quick and easy go-to, I recently started making glazes for the salmon (queue your gasp of surprise), which I add once the salmon is almost finished cooking. The honey-mustard combo works like a charm (as does a maple-balsamic), giving sweet yet tangy flavor. All I did was combine a little honey with olive oil and stone ground mustard to up the ante on this meal. 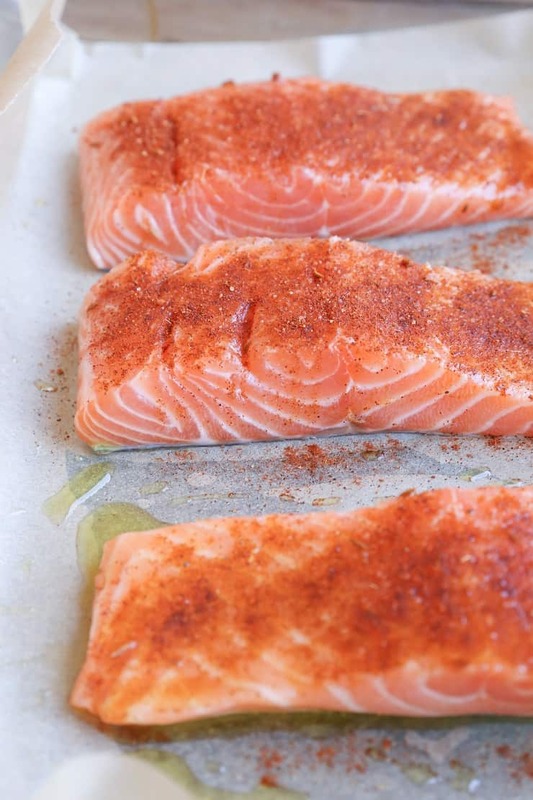 I broil the salmon with spices on top as usual…. Then about 6 minutes into the baking, I add the honey mustard glaze. I continue broiling for another 2 minutes, and the end result is a super crispy, perfectly glazed salmon with amazing flavor. Serve with crowd-pleasing roasted vegetables and kale and blueberry salad with vegan buttermilk dressing! BOOM! : an essential meal for your life! 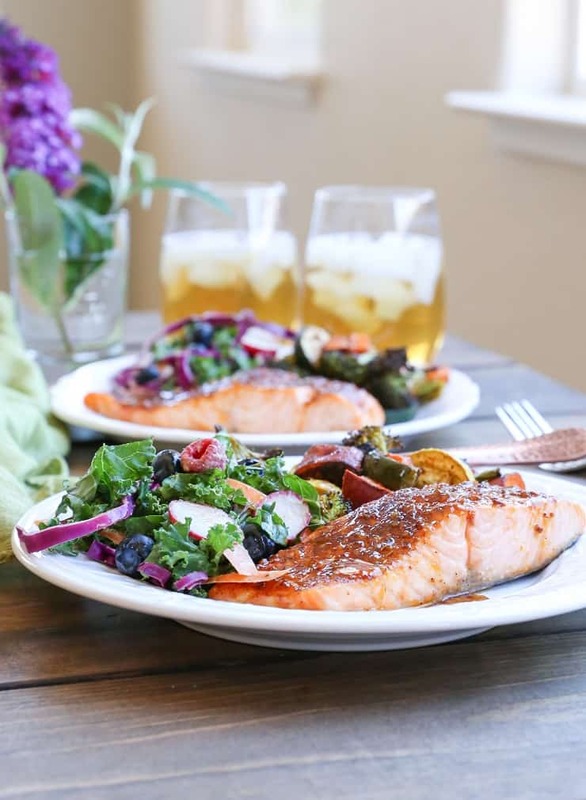 One last directive and then I’ll let you be free: Remember to keep a lookout for Copper River Salmon at your local grocery store, or simply talk to the guy or gal behind the seafood counter to get more information about where the products are sourced. Stir together the ingredients for the glaze in a small bowl until well combined. Set aside until ready to use. Preheat your oven to the high broil setting and lightly oil or spray a baking sheet or casserole dish. Stir together the paprika, garlic powder, onion powder, dried oregano and sea salt in a small bowl. 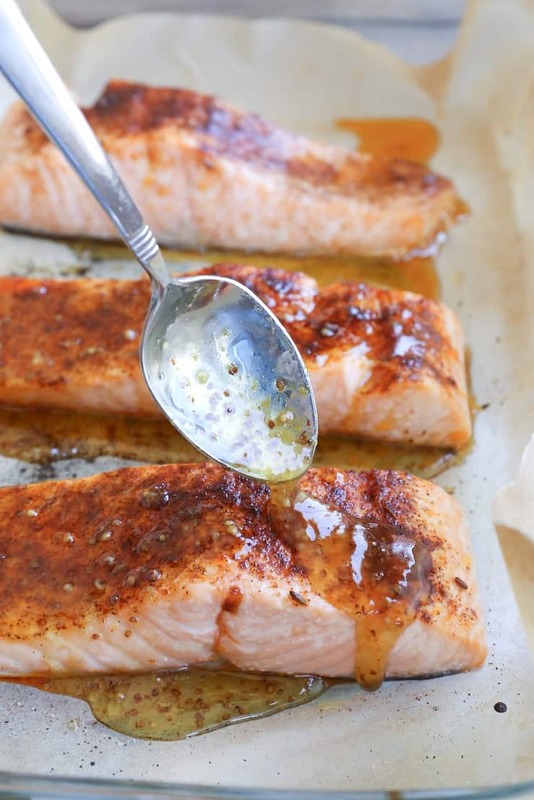 Place the salmon in the prepared dish and drizzle with olive oil. Use a brush (or your fingers) to spread the oil over the full surface of the fish. Sprinkle the spice mixture over the salmon, creating an even layer of spice. Place the sheet of salmon on the second-to-the-top shelf in the oven under the broiler. Broil for 6 minutes. 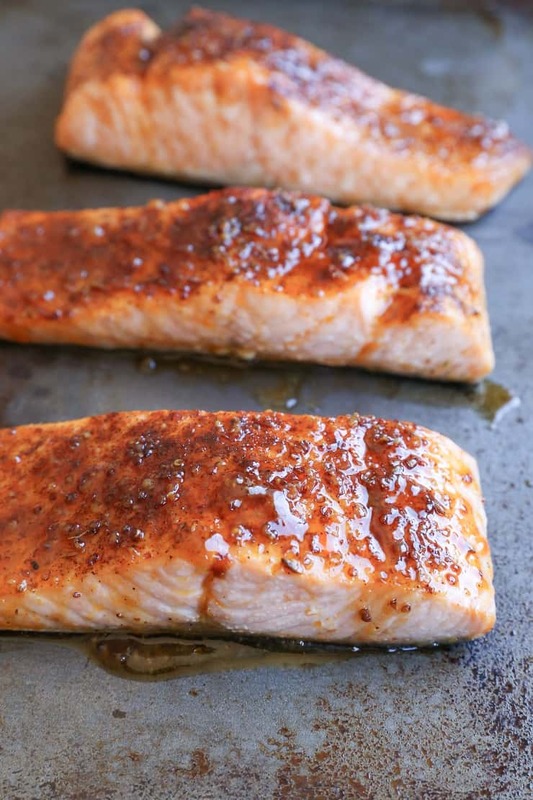 Remove salmon from the oven and drizzle with the glaze mixture. Place salmon back in the oven and broil an additional 2 to 3 minutes, or until salmon is golden-brown and cooked through. *honey can be replaced with pure maple syrup. The pictures and this meal are beautiful, Julia. You are the queen of crispy salmon! You know I don’t eat fish but I have great respect for the fact that you are careful to source it wisely. I don’t think a lot people understand how unsustainable and unhealthy some commercial fisheries are so I think it’s awesome that you shared your experience at Copper River to show there is a better way to do things. Wonderful recipe and cooking tips. I will have to head to Village Market and see what salmon they have tonight. I really enjoyed your post regarding Cordova and Alaska fishing. The photos are amazing! I only eat wild salmon and learning more about the fishing industry in Alaska would be such a great experience. I prepare salmon once or twice a week, and I love a simple preparation like this because it just doesn’t need much more! This meal is so elegant! Holy yummy deliciousness. I adore salmon in all forms (minus farm raised of course lol) what is the level of cook (rare/medium/etc) that the salmon turns out? I prefer mine barely cooked through.. So I only started to like salmon about a year ago (interestingly enough around the same time that I developed an intolerance to dairy – I find the timing completely fascinating). 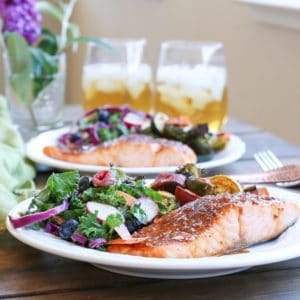 I’ve only been brave enough to try a few recipes with canned wild alaskan salmon but I really need to just bite the bullet and try it with fresh… because this looks SO GOOD!